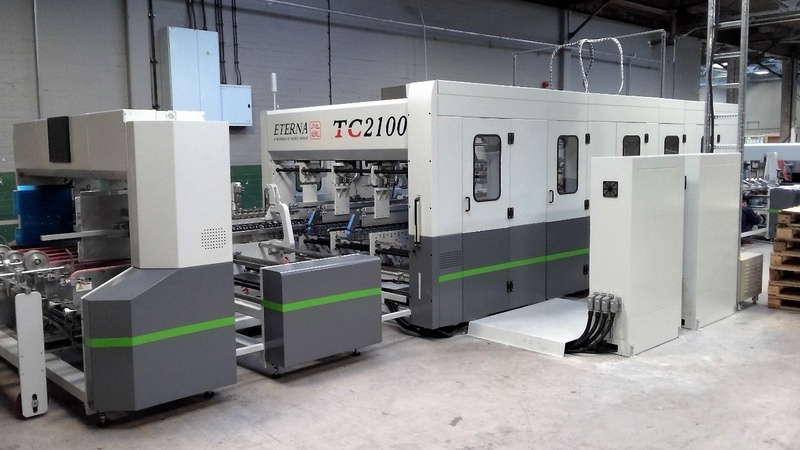 Manchester Paper Box have taken delivery of an Eterna TC2100 C6 multi-point gluer, supplied & installed by Cambridgeshire-based machinery manufacturer M&K Trading Ltd who are the UK & European agent for Eterna’s range of folder gluers. MPB are a large independent sheet plant with multiple sites offering their customers a wide variety of packaging solutions and have been long standing customers of M&K for many years, explains Robert Jess, Sales Executive for M&K. 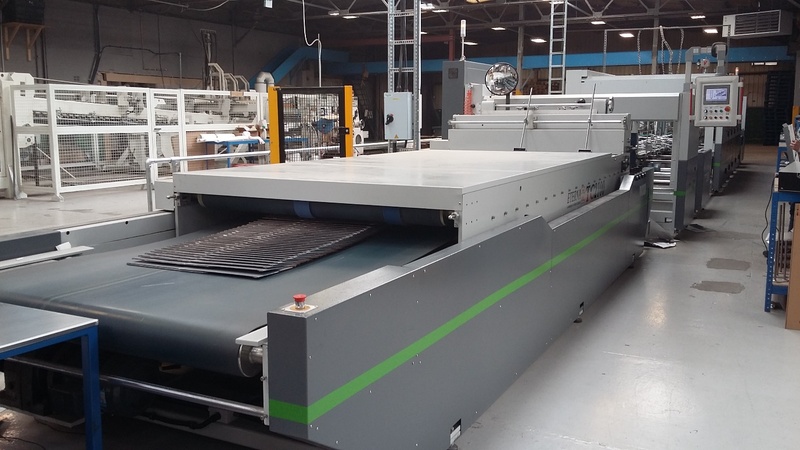 The fully automatic 2100mm large format multi-point gluer is the largest Eterna gluer in Europe and has a maximum sheet size of 1300mm x 2100mm with an impressive maximum belt speed of 260 mtrs/min. Eterna is a member of the Bobst Group and offers a range of sturdy multi-point gluers in sizes of 1450, 1700, 2100 and 3200mms. The TB 1450 model offers a very high standard of included equipment, like all of the Eterna gluers and is ideal for smaller box requirements. It can be supplied as a straight line, crashlock or four and six corner gluer. The latest range from Eterna is the TC series supplied in widths of 1700, 2100 and 3200mms. As with the TB 1450, the TC series is equipped as standard with a wide range of features and accessories to help the end user process just about any style of box. The Eterna TC range has a great deal of standard equipment making it a very versatile machine that will not break any budget. > Modular design, easy to upgrade as per customer’s requirements. > Linear Rail system throughout the machine on all carriers for precise positioning. > Motorised carrier movement with digital position display. > Driven Upper Carrier and pneumatic piston system for a wide range of corrugated boxes. > User friendly accessories, easy to mount and operate. > Pneumatic front stopper and squaring device to aid gap control and eliminate fish tailing. > Long delivery section with pneumatically controlled pressure for different box thicknesses. 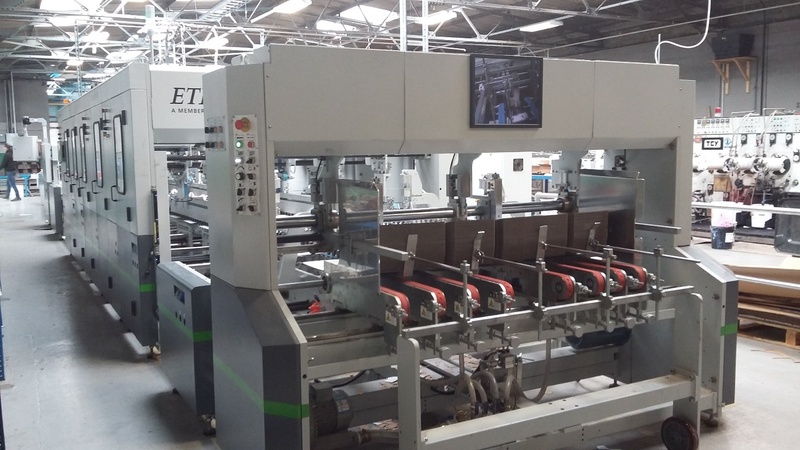 The feeder section has vacuum feeder belts, variable speed control motorised and pneumatically lifted side lays plus the right or left-hand side alignment devices. This ensures that blanks leave the feeder precisely aligned to avoid any issues during the folding process. The four and six corner section is of three carrier construction to suit a wide range of regular and non standard boxes. There are dedicated four and six corner modules and the upper carriers can be adjusted pneumatically for a range of box thicknesses. The TC series can be fitted with any electronic glue system of choice, it can either be integrated with the machine during construction or added during the installation. This allows the user to stay with a preferred glue system supplier or choose system which offers a variety of quality control features. 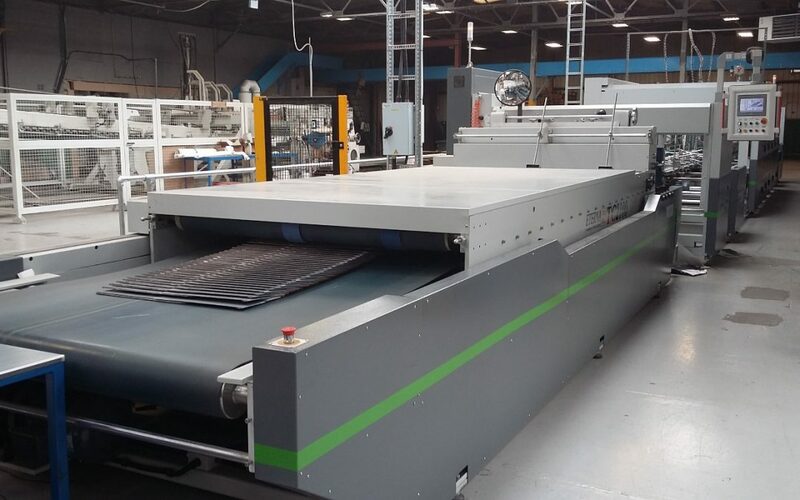 Controlled folding is assured with a long folding section which has independent variable speed adjustment for both right and left hand folding belts. Jam detection and in-line pneumatically operated squaring fingers lead into the delivery section where there are three independent infeed conveyors with squaring devices to ensure that irregular box shapes are precisely squared. The delivery section has an integrated box stream regulator ensuring precise and consistent box spacing. It is also equipped with a rear stack corrector device to perfectly align and square RSC type boxes.